There may be 9 essential amino acids, but none is more important to the bodybuilder than leucine. 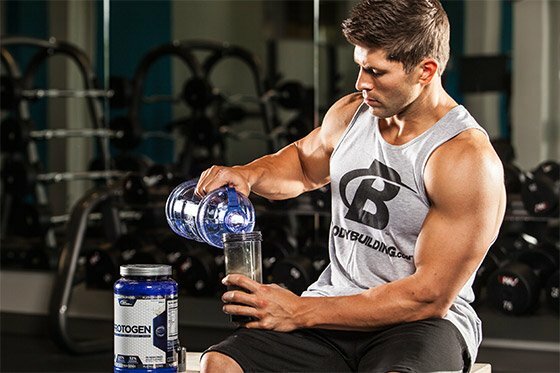 Here's the latest research on how this branched-chain amino can boost protein synthesis. Imagine being told that there was a switch you could flick to stimulate muscle growth, just like the light switch you turn on to illuminate a room. After killing it in the gym for an hour, something tells me you would hit the switch faster than Uncle Bob gets drunk on Christmas Eve. Training sets the stage for muscle growth, but it's not enough by itself. You also need protein. No source is better than whey protein, due to its high amino acid score, and more specifically its leucine content. Leucine, one of the 9 essential amino acids—"essential" means it cannot be made by the body—is considered the "switch" that stimulates protein synthesis. There has been a tremendous amount of research surrounding leucine, and this is information you need to know—but only if you want to grow. Let's take a look. Leucine, isoleucine, and valine are the three branched-chain amino acids (BCAAs) that are highly effective for stimulating skeletal muscle protein synthesis. Interestingly, leucine has much greater power on stimulating protein synthesis compared to any other amino acid. One of the most researched pathways of muscle growth is called the mTOR pathway (mechanistic target of rapamycin), and leucine activates complex muscle-building pathways via mTOR. 1,2 In fact, mTOR is highly sensitive to concentrations of leucine. Here's what happens: Declining leucine levels signal mTOR that there's a lack of dietary protein present to synthesize new skeletal muscle protein, therefore disabling mTOR. Upon ingesting increased concentrations of leucine, the elevated amino acid then signals mTOR that sufficient dietary protein exists, and switches on overall protein synthesis. An important point to remember is an increase in mTOR activity (and all aspects of the pathway with which it belongs) results in an increase in protein-building and more growth! It really is that simple: Flick the leucine switch and you start growing, assuming you're training and eating enough to support anabolism. Leucine is considered the "switch" that stimulates protein synthesis. No surprise, then, that leucine has been a name in gym circles in recent years. To better clarify the impact of essential amino acids, and in particular the impact of ingesting more (or less) leucine in comparison to the other essential amino acids, a study was completed at the University of Texas in Galveston. This study recruited young (28-30 years old) and old (66 years old) participants, and had them ingest 6.7 grams of essential amino acids dissolved in a noncaloric drink. 3 In one condition, the solution contained 1.7 g of leucine (26 percent leucine which is commonly found in whey protein). The other condition provided 2.8 g of leucine, which made its leucine content 41 percent of the total amount of essential amino acids. Does increasing the amount of leucine from what is provided in a typical serving of whey protein result in positive changes in muscle protein metabolism? Does the age of the participants effect how they respond? The combination of whey protein and added leucine maximizes muscle protein synthesis before and after resistance exercise. They found that the amount of leucine that was given to younger participants had no particular impact on protein synthesis. In other words, the changes observed in muscle protein metabolism were similar in the young participants, whether the amount of leucine was 26 percent or 41 percent. In the young group, when both amounts of leucine were provided, significant increases in blood levels of amino acids occurred very rapidly. In fact, within 15 minutes of ingesting each solution, blood levels of the essential amino acids began to rise rapidly, and within 30 minutes of ingestion they reached their peak levels. In addition, rates of muscle protein synthesis reached similar peak levels regardless of whether the solution contained 26 or 41 percent leucine. 30 grams of protein every time you eat (assuming you're eating 5-6 times each day). The older group, on the other hand, saw an increase in protein synthesis only with the 41 percent solution. This should come as no surprise, though, as previous research has demonstrated reduced muscle protein synthesis in older individuals when only small amounts of essential amino acids are ingested.7 Due to a possible decrease in sensitively to leucine, individuals 65 years and older should aim to consume extra leucine to activate muscle protein synthesis. 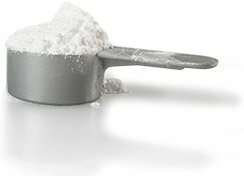 Supporting these findings, a recent study published in "Nutrition Journal" highlighted the changes seen in muscle protein synthesis after older men consumed a combination of protein and amino acids.4 In one group, the study participants consumed a combination of whey protein that also contained added leucine, and in another group, the study participants ingested a drink containing milk protein. Both groups were given the same amount of calories, but what was different was the amount of protein and leucine that was delivered. Rates of muscle protein synthesis were maximized and much greater both before and after a single bout of resistance exercise when the combination of whey protein and added leucine was given. In simpler terms, leucine turns on protein synthesis, which stimulates muscle hypertrophy. Even adding leucine by itself to protein assists to further stimulate muscle protein synthesis. A study published by European colleagues in the "American Journal of Physiology" had eight male study participants complete three separate research trials.5 During all trials, separated by one week, a single bout of resistance training involving primarily the lower body that lasted 45 minutes was completed. Lower rates of muscle protein breakdown and higher rates of muscle protein synthesis were seen in the trials that provided protein and leucine in comparison to the trial that just provided carbohydrate. Less protein was oxidized for fuel and rates of protein synthesis were higher over a six-hour period when leucine was added to carbohydrate and protein. Leucine turns on protein synthesis, which stimulates muscle hypertrophy. A study published this year by researchers at McMaster University in Canada in the "American Journal of Clinical Nutrition" assessed the impact of several different combinations of different doses of whey protein and individual amino acids on changes in muscle protein synthesis, both at rest and after single bout of resistance exercise.6 Forty men with an average age of 21 were recruited and underwent resting and exercise conditions. One group ingested a 25-gram dose of whey (3 g leucine), the second group ingested just 6.25 g of whey protein (0.75 g leucine), a third group ingested 6.25 g whey supplemented with leucine to 5 g total leucine, and the fourth group ingested 6.25 g of whey protein supplemented with BCAAs to total 5 g of leucine. The results showed that 6.25 grams of whey protein plus a high dosage of leucine (5 g) was more anabolic than the same dose of whey with less leucine (3 g). What's more, it was just as effective at increasing protein synthesis rates as a high-protein dose (25 g). In other words, increasing leucine levels can compensate for a suboptimal dose of whey protein. You'll still get the same degree of protein synthesis. Here are some supplementation strategies you can use to help you maximize the benefits of leucine. Consume 2.5 grams of leucine (or 5 g of total BCAAs) within 30 minutes of training to support an anabolic stimulus. Combine another 5 grams of leucine (or 10 g of BCAAs) in your post-workout protein shake. Consuming leucine between meals is encouraged for accelerated recovery and enhanced protein synthesis. Individuals who are dieting and want to maintain lean muscle mass should consider adding a leucine supplement, which can certainly help reduce any potential catabolic effects and prevent muscle breakdown. Just 2-3 grams of leucine should do the trick. Jonathan Mike, CSCS, NSCA-CPT, USAW, competes in strongman and is pursuing his PhD in exercise physiology from the University of New Mexico.